Christian Constant knows about the quest for perfection, having chased after Michelin stars for most of his career before devoting himself to simpler cooking. Maybe that’s why this small two-level bistro, one of four restaurants he owns in the same street, gets all the ingredients right, from the vintage décor with a zinc bar in the front to the menu that often reads like grand-mère’s scribbled notebook. Arriving at 12.30pm on a Saturday during school holidays we found a table immediately; this is unusual here so it’s worth showing up early. Squeezed into the downstairs room, which feels brighter and airier than upstairs, we chose from the blackboard menu (starters €11, main courses €16 and desserts €7) and a list of daily specials propped up on the bar. French customers can’t help but feel a pang of nostalgia at the sight of dishes such as veal cordon bleu, but there are also some surprisingly sophisticated offerings. We selected one of these to share as a starter: puff pastry topped with baby spinach leaves, gambas (prawns) and a foamy lemongrass sauce. Far beyond what you might expect for the price, it was generous enough to satisfy us both, with a delicate balance of flavours and textures and very fresh ingredients. Roast chicken might sound ordinary until you taste the free-range patte bleue breed prepared here in the classic way with herb butter, bacon strips, pearl onions and mushrooms. Sticking to the comfort food theme, we also ordered the veal cordon bleu: so often pre-made and pallid, here it becomes a glorious thing with a crunchy golden coating, oozy cheese and ham that could easily inhabit the best jambon-beurre. The accompanying dish of butterfly pasta with cream sauce took us right back to childhood, though as adults we found it a little too rich to finish. 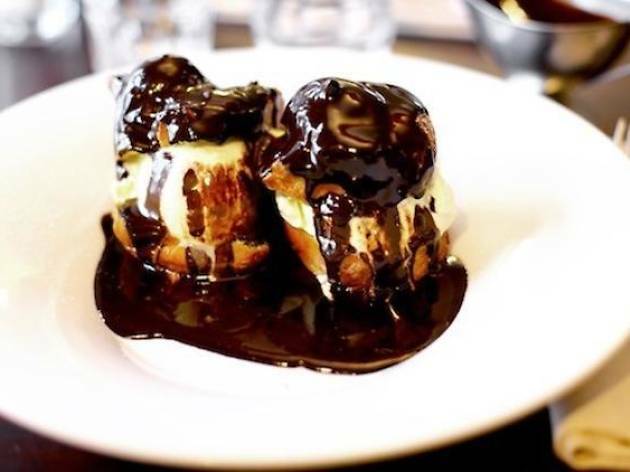 Constant truly excels at desserts, from the gargantuan profiteroles favoured by many of the regulars to a sculpted île flottante bathing in its sea of caramel-drizzled custard. 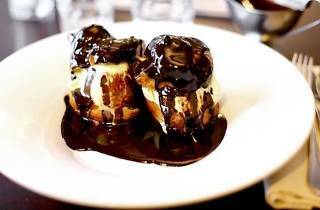 Spiced prunes in red wine, though not the most glamorous choice, turn out to be addictively spicy, a dessert we would happily order again. You can’t often say in Paris that the bill comes as a pleasant surprise, but here you don’t need to brace yourself with wine for l’addition. Our only complaint about Café Constant is that there isn’t one in every neighbourhood. An absolutely spot on review from Time Out that led to a wonderful and delicious lunch with impeccable service. Very definitely recommended.